When I learned that A La Cuisine! was hosting this month's IMBB and that the theme was TasteTea, I certainly had my doubts, because a la cuisine! is one of the most formidably beautiful food blogs around, and because I had no idea what to make with tea. 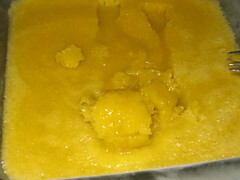 Inspiration came, however, in a recent episode of The Naked Chef in which Jamie Oliver made a passion fruit sorbet. 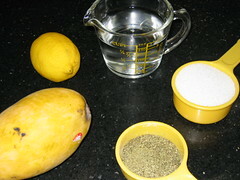 A quick Google turned up some recipes for Mango and Green Tea sorbet, which sounded interesting enough to reproduce. If you're using a ripe, sweet mango, perhaps the amount of sugar used could be reduced slightly, but otherwise this recipe works just fine. 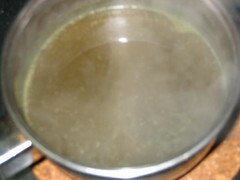 Dump the tea leaves and water into a saucepan and bring to a boil. 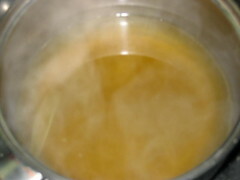 Once boiling, remove from the heat and let the tea steep for 5 minutes. If you ask me, it's a lot easier to boil the water first, but all the recipes seemed adamant that the tea leaves and water had to boil together. It's really not much to look at, being a rather putrid shade of green. Thankfully you won't be using it as is. 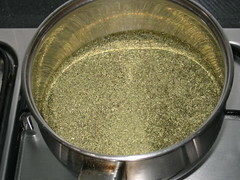 Strain the tea into a separate saucepan/container containing the sugar. Be sure to use a fine sieve, as those little tea leaves have a habit of slipping through the coarser ones. The heat of the tea should be sufficient to dissolve the sugar with a little stirring. Allow the tea to cool to about room temperature by either leaving it out on the open or using an ice bath. 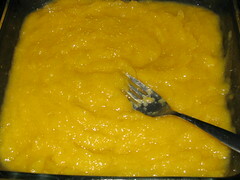 While the tea is cooling, prepare the mango puree thusly. 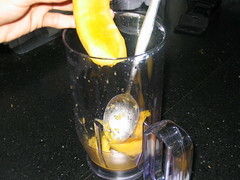 Scoop the flesh from the mango and place it in a blender/food processor. Be sure to get as much from it as possible. 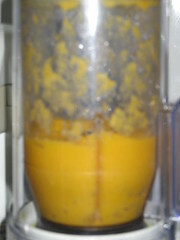 Puree the mango till you get a mango paste. If you think this is messy, wait till you see what comes next. 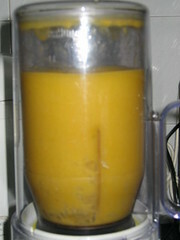 Pour the cooled tea into the blender and blend along with the mango puree, till you get something that resembles a mango shake. 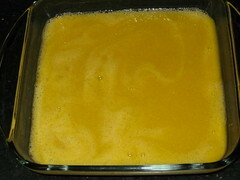 Pour the liquid into a suitable dish and freeze for a few hours. Depending on how much you're making, freeze the sorbet and check back in 1 - 3 hours. It should just have set and should be semi-frozen, semi-liquid. Stick a fork into it - most of the sorbet should be frozen, but the bottom will probably still be liquid. 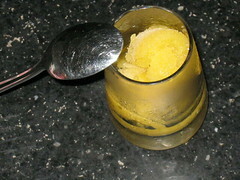 There should be enough air in the sorbet to prevent it from becoming a total block of ice. The idea now is to introduce even more air, so that the sorbet refreezes smoothly and evenly, and the end result should be soft and airy. Just mash up the sorbet with the fork, reaching all corners of the dish and breaking up any ice lumps. The sorbet should be all slushy by the time you're through with it. Now, simply refreeze and take it out to enjoy once frozen. 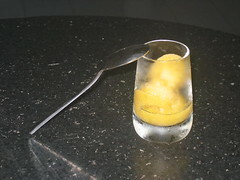 Use a melon scoop to scoop out the sorbet and serve it in dainty glasses as an intermezzo or dessert. Lovely.